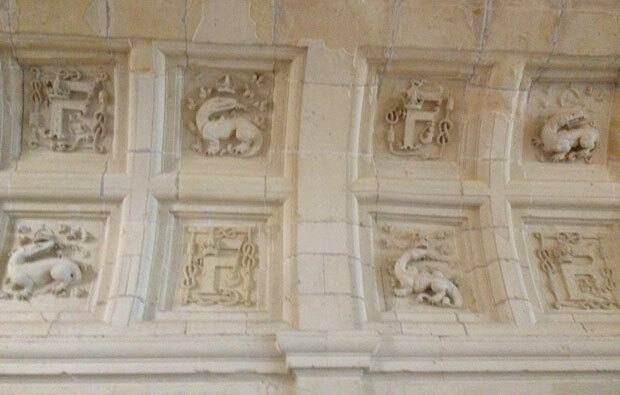 The day we went to Chambord, we really needed the break from our fireplace renovation. 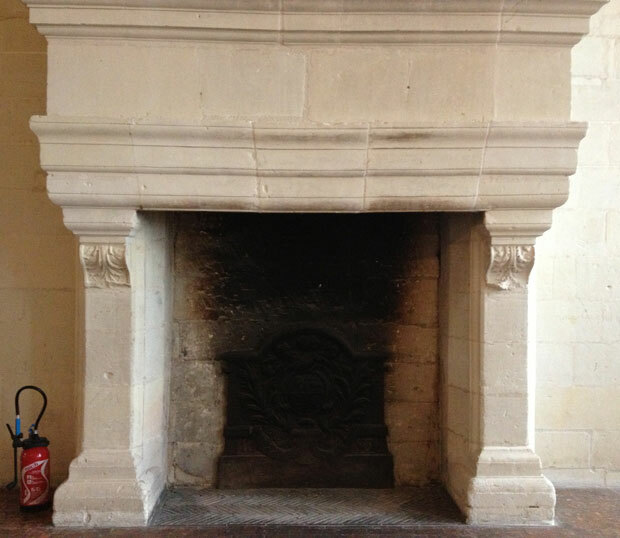 What I didn’t realise is that Chambord has over 300 fireplaces, a few of which look remarkably like ours. 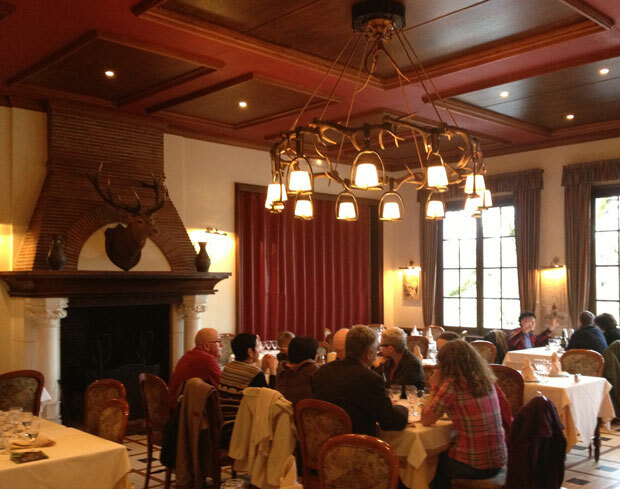 We had decided to have lunch at the Saint Michel, just opposite the château and as we entered the restaurant, the waitress apologised for the smoke from the fireplace. Well, we know what the problem is, don’t we! Tightly closed windows and insufficient air intake. But it was pleasant to have a fire and our Australian friends appreciated the hunting decor and actually liked the smoke. 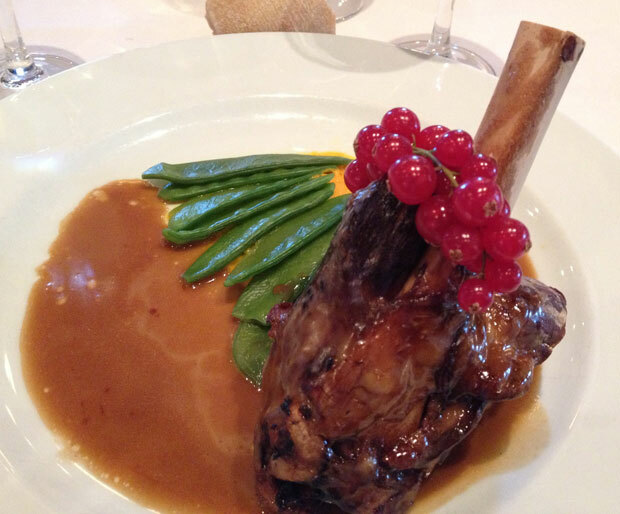 We all ordered the 22 euro “bistrot” menu as opposed to the 37 euro gourmet menu. I was amused to see that all the starters on the bistrot menu were Italian (smoked salmon and prawn cannelloni, prosciutto and mozarella bruschetta, beef carpaccio and mini red peppers stuffed with ricotta) while the main courses were traditional dishes (dear stew – no kidding – steamed haddock, three fishes stew and lamb knuckel-end & smashed carrots – also in the original. Dessert was pear financier, French pain d’épices toast with salted-butter caramel ice-cream and crème brûlée with green lemon – they meant lime of course. The food was tasty and fresh, except for the French toast which had seen better days, and the service was friendly. I learnt afterwards that it’s also a very reasonably priced hotel. 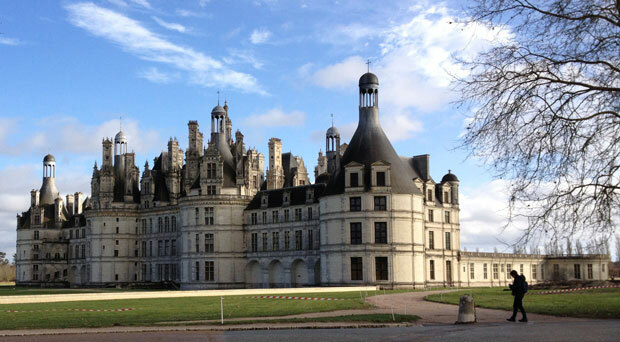 I don’t know what the rooms are like but having breakfast with that fabulous view of Chambord might be worth a bad bed! 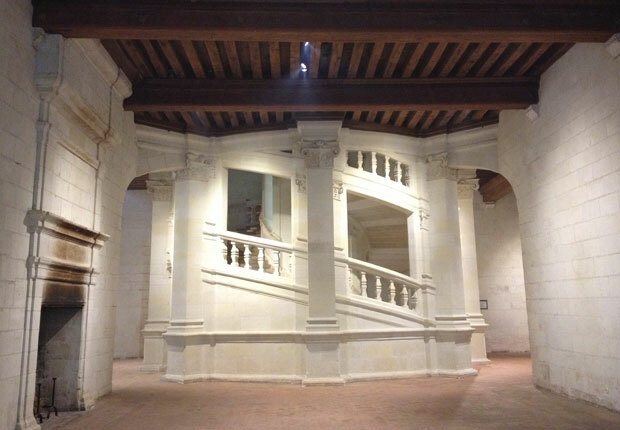 The first thing we saw when we went into the château was the famous double-revolution staircase where two people can go up or down without ever meeting. Note the lack of people in the photo, perfectly possible in winter and totally unheard-of in summer. We were fascinated with the fireplaces and firebacks of course and loved the beautiful ceilings and other architectural details. One of the fireplaces is exactly the same shape as ours. We headed for the roof (see my previous post on Chambord) while the light and weather were still good, which were were perfectly right to do because it started raining as we left. After our visit to the rooftops, I then discovered that there is a series of furnished rooms which I have never seen before. It seems that in the mid-nineteenth century, the Count of Chambord decided to open the château to the public and furnish some of the apartments with his own private collection, mainly consisting of royal portraits. When it became State property in 1930, there were 440 pieces, but only seven pieces of furniture. 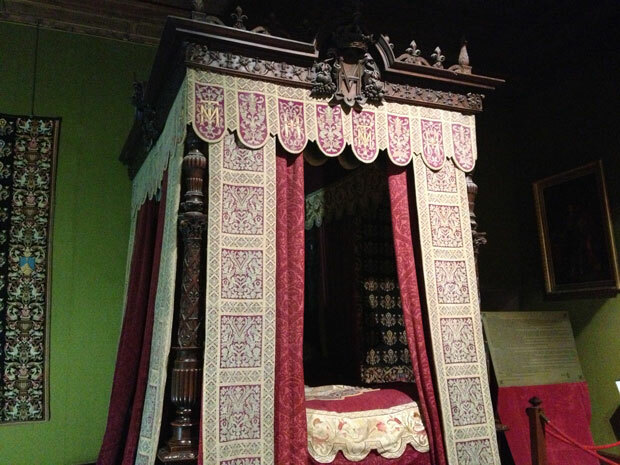 Today, there are 4,500 objects, including tapestries from the 16th to 18th centuries, and a large collection of furniture, particularly four-poster beds and objets d’art. 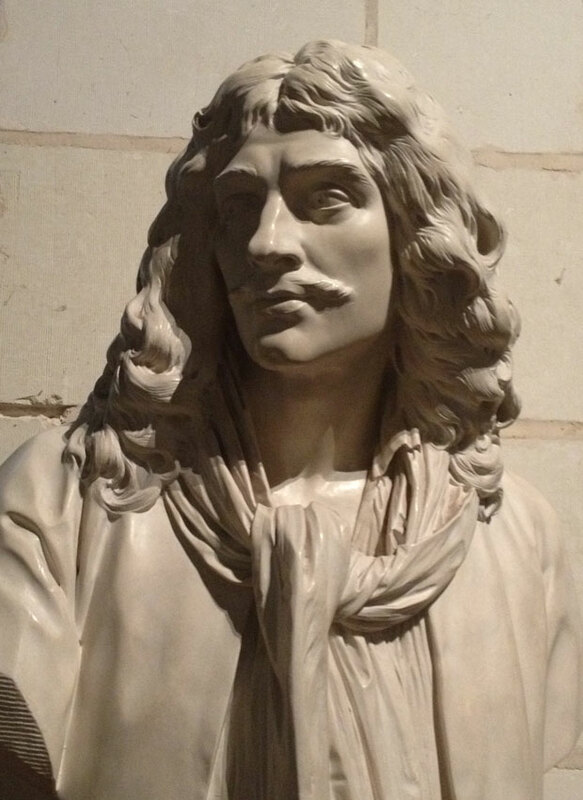 I even saw a bust of Molière, which I found surprising, but Louis XIV was also the master of Chambord and came to stay a total of nine times (far more than François Ier! ), inviting Molière’s theatre troupe for entertainment. The fireplace that most resembles ours! I felt as though I hardly touched on the wealth that Chambord has to offer, so next time we cycle there, I’ll make sure we visit as well. I may have to get a season ticket! 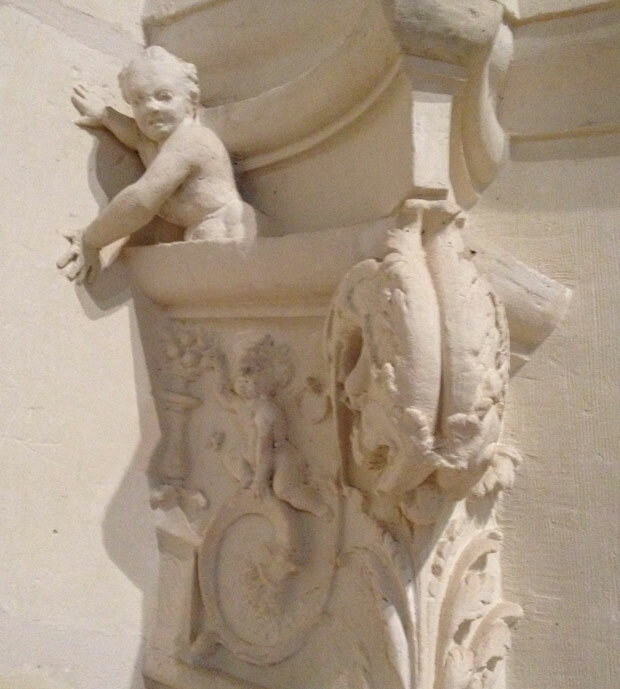 This entry was posted in Architecture, Loire Valley, Restaurants, Sightseeing and tagged Chambord, Le Saint Michel, Loire Valley châteaux. Bookmark the permalink. I vaguely remember Chambord through the exhaustion of riding a bicycle to visit it. Far too many of the rooms at Chambord are dedicated to stupid greedy 19th C pretenders for my taste and are perfectly hideous in the way only over decorated 19th C rooms can be. More of the dashing young François I say! More textiles, less wallpaper! Actually, if you’ve got the time and the inclination, it is a fascinating dollop of French history from Renaissance to post-Revolution. Fireplaces like the one featured are (or were) extremely common here. A lot of them have had their fronts hacked off, presumably because they projected too far into the room, but I see their remains all the time in ordinary houses. And why is it that French businesses translate stuff into English, but apparently never get it proof read? It’s not like there is a dearth of native English speakers in the country. You’re talking to a professional translator here! I simply cannot understand that not only businesses, but also State museums and historical monuments, do their “own” translations. I have to constantly explain to my clients that translation is a profession, just like any other, and that speaking another language is not sufficient to be a translator. You just have to see the pitiful rates that French ministries (and even UNESCO and the UN!) pay freelance translators. We have two Renaissance fireplaces. One of the problems today is that most of them don’t work, so I guess that is why people hack the fronts off. It’s so sad. I’m not keen on the four-poster beds and wallpaper myself – maybe that’s why I didn’t remember those rooms!